Arista Corporation is a globally recognized leader in manufacturing video wall LCD displays, AV extenders, matrix switchers, AV Multi-viewers, and other related products for the AV installation and industrial markets. 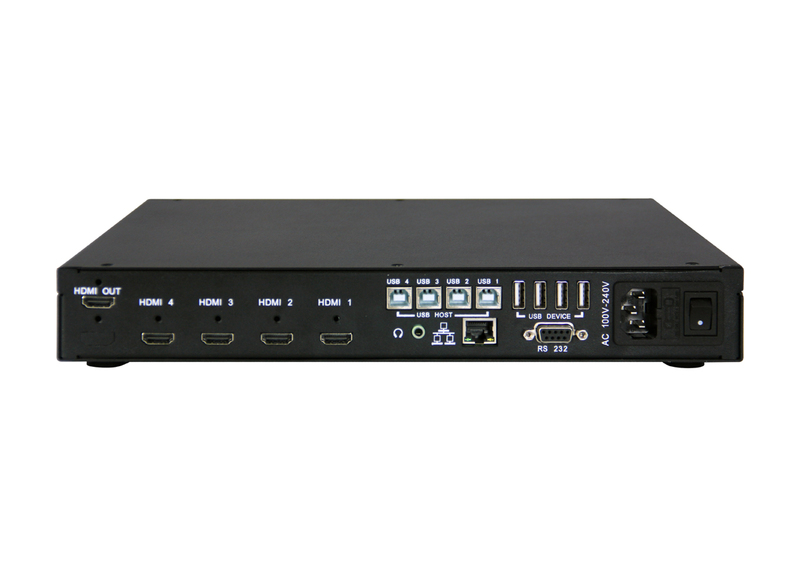 The MVD-105 UHD Output Multi-viewer is a high-performance 4K UHD Multi-viewer Switcher / Scalar. This is ideal for applications where space is limited or if there is a requirement for single focal point viewing. The Arista MVD-105 UHD Output multi-viewer is a great solution for wide range of industries including control rooms, medical facilities, command centers, and other facilities for four HDMI display of video sources on a single 4K Ultra High Definition display monitor. Each display window is delivers up to 1920 x 1080 resolution with saving space and reducing installation costs. The MVD-105 provides four HDMI™ 1.4b (4K@30Hz) inputs and one HDMI 2.0 4K@60 (3840x 2160) output. Integrated in the USB KVM Switch, operators can control multiple computers with a single keyboard/ mouse and display upto four HDMI video sources simultaneously on a single 4K UHD display monitor. The MVD-105 may be controlled via several additional options, including LAN, RS-232, and IR Remote Control. Arista MVD-105 is shipped with Arista’s MVD-108 Control Console. The MVD-108 controller can switch the video source of each display window, change the quad view on-screen layout, switch between single and quad view, and switch keyboard and mouse control in real time. The Arista MVD-105 UHD Output multi-viewer also features de-embedded audio outputs enabling audio to be extracted from each HDMI video source and monitored independently via audio output. “MVD-105 overcomes several common challenges faced by AV integrator’s and allow them to enable rich feature that enables both Picture in Picture and Picture and Picture on a single 4K UHD display, The new MVD-10 require only one 4K UHD display monitor, instead of four individual 1080p FHD display monitors. Our MVD-105 eliminates space concerns and reduces installation complexity in the process. I’m confident AV integrators will find much to like”- stated, Paul Shu, President, Arista Corporation. Founded in 1994 and headquartered in Fremont, CA, with operations in China, India, and Taiwan, Arista Corporation is committed to the highest standards of product development, engineering, manufacturing, and customer support. The company’s extensive product portfolio includes video wall LCD monitors, AudioVisual extenders, AudioVisual matrix switchers, and AudioVisual MultiViewers.